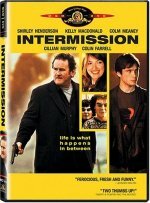 Intermission release date was Friday, March 19, 2004. This ensemble comedy of 11 interwoven stories set in Dublin shows how the breakup of one relationship has repurcussions on the lives of the people around them. One of those people is Lehiff (Colin Farrell), a thief trying to set his life straight by pulling off one last big heist before retiring, while Detective John Lynch (Colm Meaney) is trying to bring Lehiff down. There's also John (Cillian Murphy), who quits his job at a supermarket to join Lehiff in his plot as an effort to win back the love of Deirdre (Kelly MacDonald), who has recently moved in with a married bank manager, Sam (Michael McElhatton), whose bank Lehiff is targeting, and whose wife, Noeleen (Deirdre O'Kane) ends up being a crucial element in the heist.